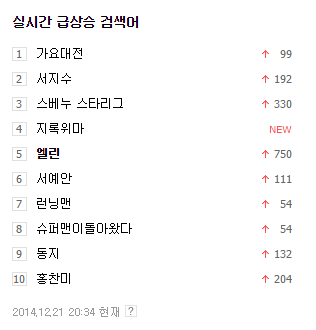 Ellin is referring to how her name is on Naver’s search ranks list. She was trending at #1 for an hour, but is still at #5 a few hours later. Still on the search ranks… Fascinating…:) Have you eaten!? 계속 실검이네요… 신기하당…:) 다들 맛있는 식사하셨나요!? *Ellin changed the lyrics of SoYou & JunggiGo’s ‘Some‘ (feels like you’re mine, it seems like you’re mine but not).